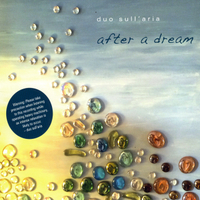 15 selections of unspeakably beautiful music arranged for solo cello and solo harp by Duo Sull' Aria. Duo Sull'Aria is harpist Nichole Luchs and cellist Steven Sigurdson. ​a place where stress and worry are not welcome. which in Italian we say . . . "sull' aria". A native of Freeport IL, Nichole started playing the harp at the age of ten through the harp program at her public school. She received her bachelor’s and master’s degrees in harp performance from Northern Illinois University and Northwestern University where she was the recipient of both the prestigious Keefer Award and Eckstein Scholarship. At Northwestern, she was a pupil of Elizabeth Cifani, principal harpist with the Lyric Opera of Chicago. An accomplished recording artist, Nichole has performed on a Sack Records recording by world-renowned steel-pan artist, Liam Teague, entitled A Christmas Gift, as well as on the debut recording of modern composer, Dexter Morrill, entitled Three Concertos for Centaur Records. She was also a featured performer on the Paideia Project, a documentary film by George Kourvetaris on the music of ancient Greece. Nichole is an active freelance harpist throughout Illinois and Iowa. She is Principal Harpist of Peoria Symphony, DuPage Symphony, and Illinois Valley Symphony, and has been a featured soloist with each group. Her other orchestral collaborations include Rockford Symphony, Evanston Symphony, Skokie Valley Symphony, Fox Valley Symphony, Quad City Symphony, and Dubuque Symphony. In great demand as a harp instructor in Illinois, Nichole is on the faculty of both Fox River Academy of Music and Art in Oswego and North Central College in Naperville, and a board member of the Greater Chicago chapter of the American Harp Society. Steven received his bachelor’s degree from The Juilliard School as a student of Leonard Rose and Channing Robbins. Upon graduation he was one of the first cellists selected by Michael Tilson Thomas to perform in Miami’s celebrated New World Symphony. He was then hired as Associate Principal Cellist of the Florida Philharmonic, a post he held for 13 years, finishing his tenure as the orchestra’s Principal Cellist. Upon returning to his native Chicago, Steven received his MBA from The University of Chicago Booth School of Business, and his future plans include applying this knowledge toward building new bridges between the business world and the arts. Since the beginning of his music career, he has been a passionate advocate for young musicians, and he currently maintains a full teaching roster of young students both of the cello and the double bass. His past pupils have gone on to successful careers in both music performance and music education. Although this recording represents Steven’s first full-length solo release in the classical genre, he has been a featured cello soloist on albums by Gloria Estefan, Extreme, Zakk Wylde, and many others. Since 1996 he has been a voting member of the National Academy of Recording Arts and Sciences, which presents the annual Grammy Awards. On this recording, Steven’s cello is an exquisite modern copy of a rare 1739 cello by Domenico Montagnana which was made for Steven in 1994 by celebrated maker, James Morris.